In the wake of the Red River Rebellion, Manitoba has joined the Canadian Confederation, and Ottawa is planning to turn the West into “one big Ontario”. In the rapidly expanding colony, Canada’s business barons compete to own the revolutionary trade and communications technologies of the day, the railway and the telegraph lines that follow its track. 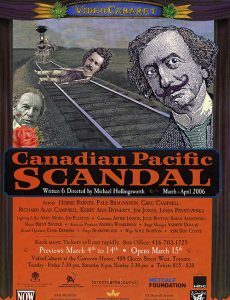 As the play begins, Prime Minister John A. Macdonald is establishing the traditions of Federal-Provincial relations – wooing British Columbia into Confederation with a railway, and making a side deal to swap the Canadian Pacific Railway contract for a large campaign donation. Caught red-handed taking a bribe from Hugh Allan, owner of Canada Steamship Lines and the Bank of Montreal, Macdonald resigns. Liberal Leader Alexander Mackenzie rides the ‘Pacific Scandal’ into the Prime Minister’s office and sends John A. to the political wilderness. Though a hunted man with a price on his head, Metis leader Louis Riel is elected as an MP from Manitoba, but denied his seat by Orange Lodge fanatics. Riel gives up on democracy, goes underground and, overcome by anger and paranoia, has a breakdown. Under the treatment of the quack Doctor Barnabé and his sister Évélina, he discovers that life inside a mental asylum is just like life outside: the only difference is the nature of the strait jacket. Wilfrid Laurier takes his fight for a secular society into federal politics and, despite the opposition of Bishop Bourget, wins a seat from Quebec and begins his rise in the Liberal party. Distanced from his unsophisticated spouse, he falls in love with Emily Lavergne, his law-partner’s wife; their affair and rumoured ‘love-child’ create enormous strife in their households.